El día 24 & 25 de julio del año 2010, el Señor General Rosendo Plascencia Quintero vino a Oregón, EEUU, para nombrar a José Carlos como capitan del Grupo Ritual Azteca Huitzilopochtli y para levantar el estandarte de la mesa de Nuestra Señora Madre de Guadalupe. Cada año se celebra el aniversario de este estandarte el primer fin de semana de agosto. Our group is represented by the image of Our Lady of Guadalupe. She represents our spiritual beliefs, that combine indigenous Aztec values and modern Christ-like teachings. 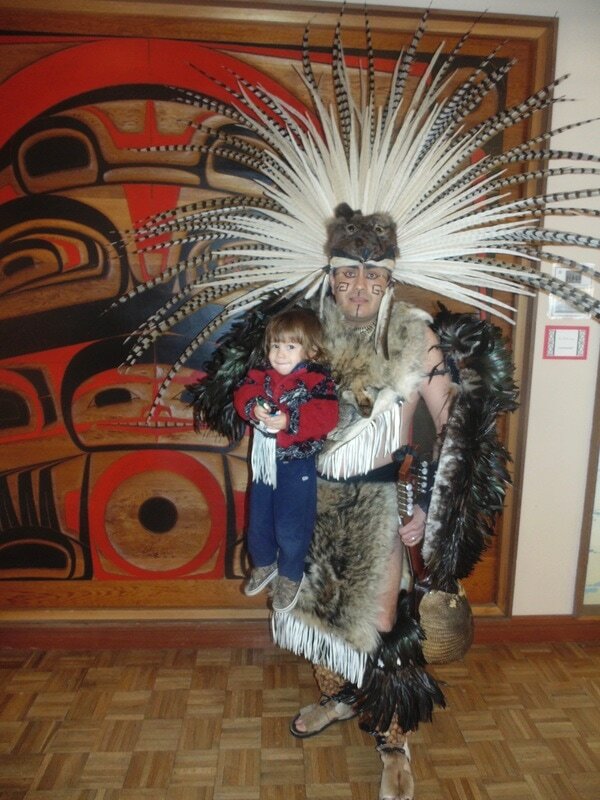 The Aztec dance was originally prohibited by Spanish conquistadores in 1521. But many of the spiritual traditions were combined with Catholic practices, in order to preserve their fate. The tall-standing huehuet drum was replaced with the chihuanda or macahuehuet, armadillo guitar. Therefore, many of the original beats and songs could be preserved. 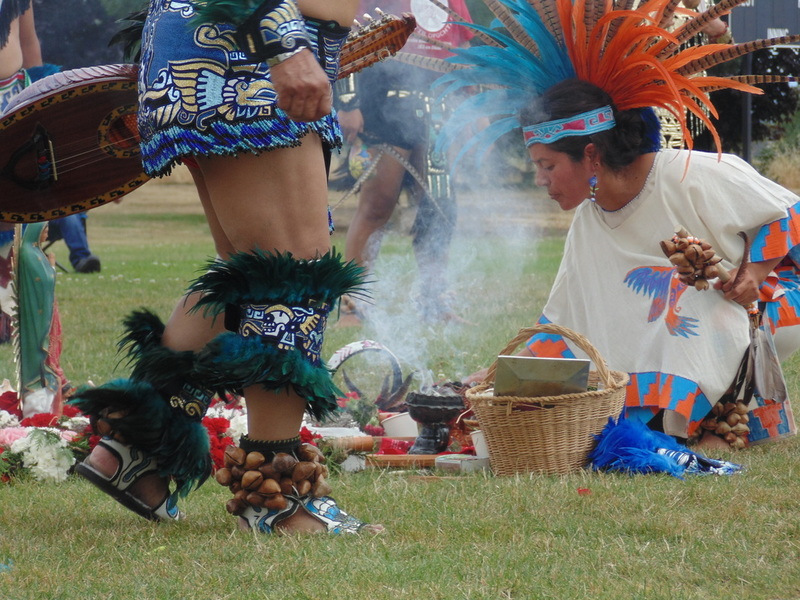 With time, many of the indigenous dancers accepted the teachings of Christ, and welcomed the apparition of Saint Mary as an indigenous woman (Our Lady of Guadalupe). Since then, most alabanzas, or religious songs, are dedicated to Jesus and Mary/Guadalupe. Alabanzas are sung at all-night vigils, known as velaciones. These are flower ceremonies, originating from Aztec culture, where participants lay out flowers in the sign of a cross and in the sign of Ollin, the symbol of movement and of our current time-period. 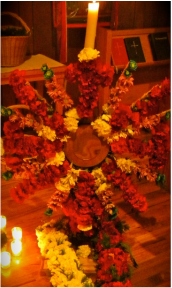 During the prayer-songs, the flowers are then tied to a standing cross and to prayer sticks. The singing and arranging of flowers lasts until sunrise, and often well into the morning. 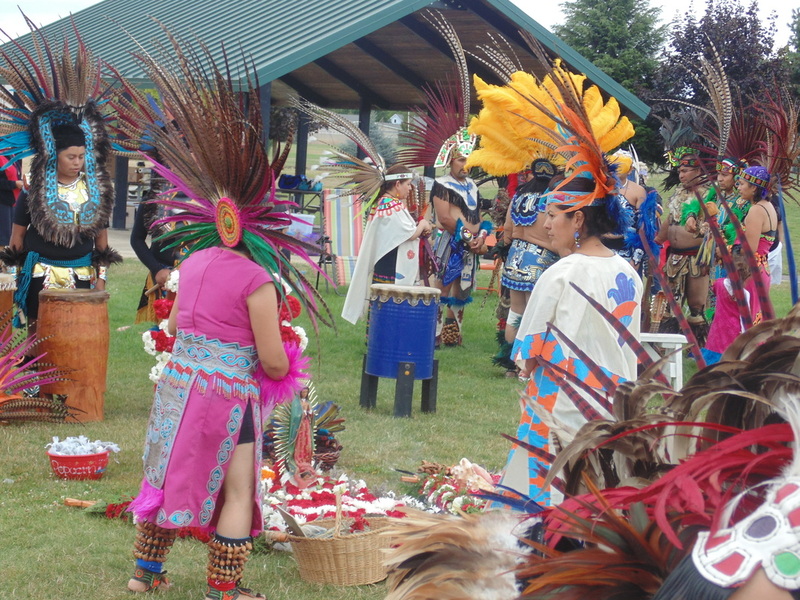 The dance ceremony follows the velacion. The Aztec Dance is still preserved in the indigenous style, guided by the tall standing drums, the ayoyote rattles, and flutes. 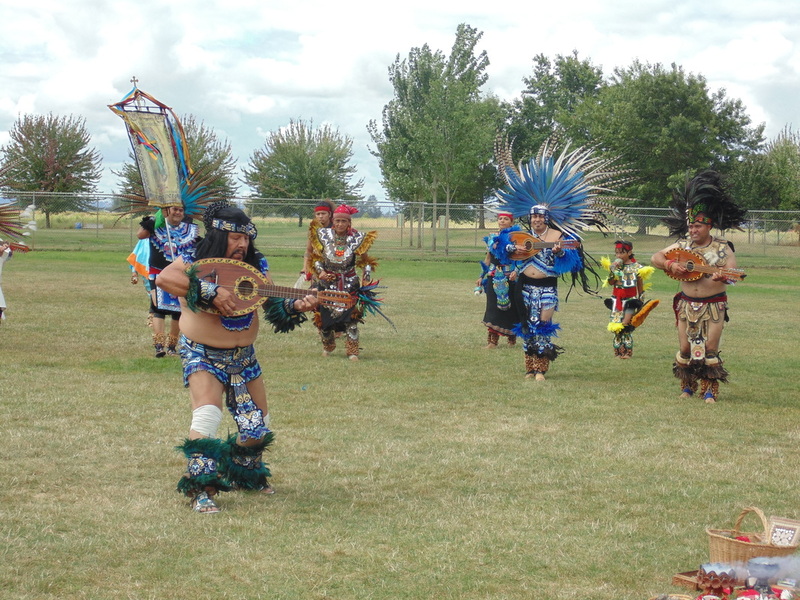 Each dance is an oral story, reminding all of the basic elements of life (fire, water, wind, earth, animals, etc). The dance is rigorous, and requires utmost discipline from the dancers. No breaks are called for rest or water. But as the dancer advances in this art-form, he/she may reach a state of meditation. Mind-over-body, and spirit-over-mind, can be achieved. This art-form not only involves dance and music, but also community respect. A circle is formed and gives a voice to each participant. 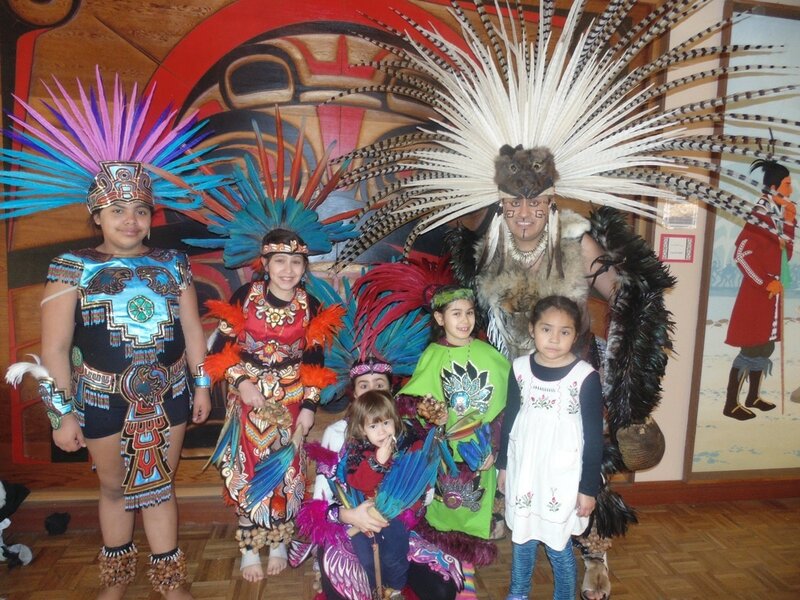 The Aztec Dance Circle teaches respect for all ages, all races and all walks of life. The circle provides an opportunity for all to pray for their families, and for the world. 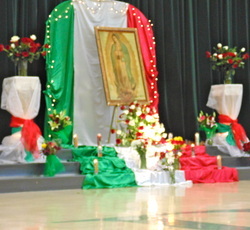 Our night-vigil on August 1st, 2014, to celebrate the flag of Our Lady of Guadalupe. Held at St. Mary's Church in Woodburn, Oregon.